"I am a big fan of combining steak and seafood. This is a cheaper option than a jumbo lump crabmeat recipe I enjoy as well. Hope you find it tasty." Heat a heavy steel or cast-iron skillet over medium-high heat. Brush both sides of each filet with 1 tablespoon olive oil, and sprinkle with salt. Gently place the filets into the hot skillet, and cook until they start to become firm and are reddish-pink and juicy in the center, about 3 to 4 minutes per side. An instant-read thermometer inserted into the center should read 130 degrees F (54 degrees C). Set the filets aside to rest, covered loosely with foil. Melt 2 tablespoons butter with 2 tablespoons of olive oil in the skillet over medium heat until the foam subsides from the butter. Cook and stir the shallot and garlic until tender, about 2 minutes. Pour in the wine, and cook and stir until the wine reduces by half, about 3 minutes. Stir in the shrimp, cream, 1 tablespoon of butter, and a pinch of salt and pepper to taste. Cook and stir until the sauce is thickened and velvety and the shrimp are pink, about 2 minutes. 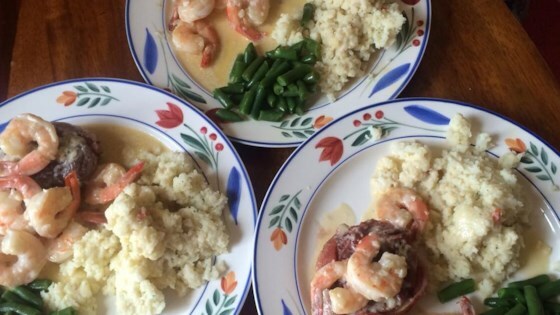 To serve, place filets on serving plates, and top each with half the shrimp sauce. Sauce will thicken slightly as it cools. I think a sorghum molasses reduction would have complimented the meat more appropriately. Keep shellfish on the side. This recipe rocks!! absolutely amazing and its so easy! i made for my boyfriend on valentines day and i wish i would have invited some friends over to show it off! a thousand thumbs up! AWSOME! i love love love red meats with seafood and this is a wonderful rcipe. I change the recipe up a little and did a cream cheese and parmesan sauce and with the steak and shrimp. It was Great !